Most of my childhood days were spent in Hyderabad's old city area. It was customary for us (me and my sister) to spend our 3 months of summer holidays with my grandparents, every year till I passed out of school. Vivid memories of eating lots of panipuri near Madina, watching bonalu (annual festival of worshiping Goddess Mahakali with special poojas, glitz, color and dance) from the roof top of my neighbour uncle's tent shop in Lal Darawaza and shopping endlessly in Chudi/Laad bazaar come rushing as I think of those carefree days spent with my adorable taatu and ammama!. Not to be confused for a Goan drink, Feni (Pheni) is actually very thin vermicelli made out of wheat flour, fried in ghee. In the narrow streets near Charminar, it is hard not to notice mounds of these being sold in the shops nearby. I am not quite sure if it is Hyderabadi by origin but my head is filled with picturesque reminiscences of feni so I had to get and make some for this A to Z series. I hope you guys will be ok with that. :-). On a low heat, dry roast chickpea flour until it turns light golden brown and the raw smell is gone. Set aside and let it cool a bit. Coarsely grind - feni with sugar. Transfer to a mixing bowl and add in besan and dry fruit powder. 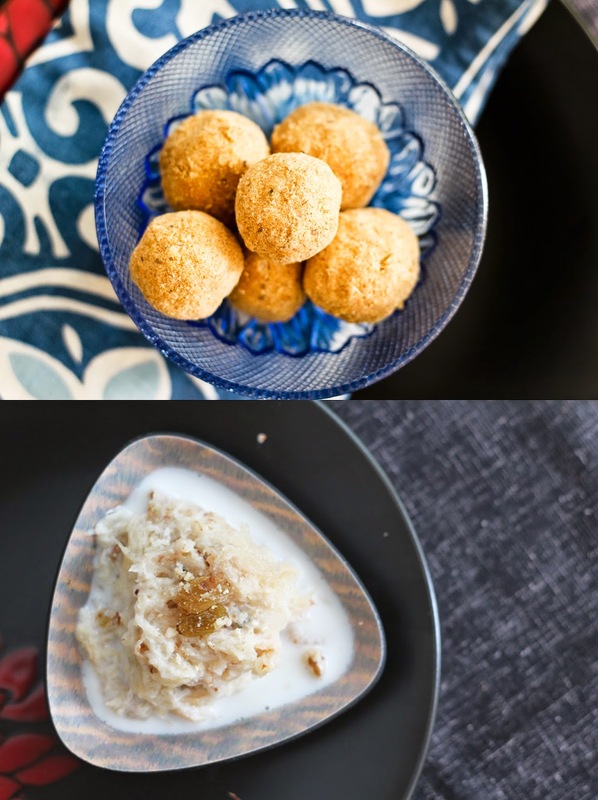 Using melted ghee as the binding agent, tightly make small laddus out of the mixture. Heat some milk and sweeten it with sugar or jaggery. Dry roast and coarsely grind some dry fruits (almonds, pistachios, walnuts, raisins etc). Place a small amount of feni in a serving bowl and pour sweetened hot milk over it. Sprinkle some dry fruit powder and serve immediately. Beautiful, images and tempting recipe, well written. This is awesome! Do we need to fry the vermicelli in case we don't get the ghee fried one here? Hi Richa, feni is not the usual vermicelli. It is a very very thin one usually fried in ghee. If you have something which resembles the feni-texture, yes fry it in ghee until light brown. Hope this helps.